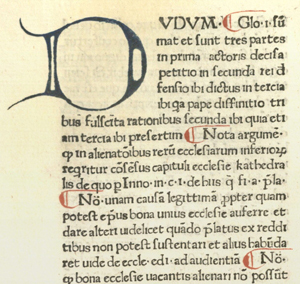 The third of Yale Law Library’s four books from 1471 is a canon law commentary: Dominicus de Sancto Geminiano’s Super secunda parte sexti libri decretalium (Rome: Adam Rot, 1471). The author, Dominicus de Sancto Geminiano (a.k.a. Domenico da San Gimignano), was considered one of the best canonists of his time. He taught law at Bologna’s famous law school, where he earned a doctorate in canon law in 1402, and was an official in the papal law courts. He was a prolific author. This commentary on the Liber Sextus is one of his most important works. In his Bibliographical Decameron (1817), Thomas Frognall Dibdin refers to the book’s printer, Adam Rot, as “that subtle and coy typographical artist … of whom we know little or nothing in this country.” Not much has been learned since then. Rot was one of the early group of German printers in Rome. The Incunabula Short Title Catalogue lists 37 titles printed by Rot in the period 1471-1474. He published several volumes of consilia by various jurists. He was the first publisher of guidebooks for pilgrims to Rome. The Super secunda parte sexti libri decretalium is Rot’s earliest book bearing an imprint date. Our copy is printed in roman type, with elegant hand-drawn initials in alternating red and blue, and red paragraph marks. A frequent question from visitors is “What is your oldest book?”. For printed books, there are four contenders for the distinction. All of them were printed in 1471, seventeen years after Johan Gutenberg produced the first printed book, his 42-line Bible. This series of posts will introduce them. First up is the 1471 edition of Gratian’s Decretum, printed in Strassburg by Heinrich Eggestein. It is the first printed edition of the Decretum, one of the foundational texts of medieval and early modern canon law. Gratian, a 12th-century cleric who became bishop of Chuisi in Tuscany, compiled thousands of authoritative statements of church law and attempted to reconcile the differences. The Decretum was the basic textbook of canon law for centuries, and formed part of the law of the Catholic Church until 1917. The printer, Heinrich Eggestein, might have first learned the new art of printing from Johan Gutenberg himself at Gutenberg’s workshop in in Mainz, and might have even witnessed the printing of Gutenberg’s Bible. From 1466 to 1488 Eggestein printed books in Strassburg, beginning with a Latin Bible, and printed many books of Roman and canon law. Eggestein’s 1471 Decretum is one of our prettiest incunables. 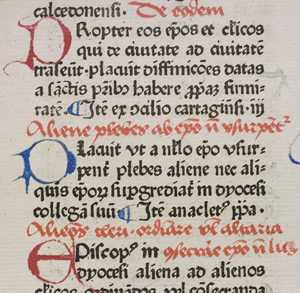 It is printed in Gothic type, with initials and paragraph marks in alternating red and blue. It is also quite possibly the heaviest book in our collection, weighing in at a whopping 28 lbs.! I picked up a volume to catalog that until recently was in the the Los Angeles County Law Library. We acquired it at auction in London in the spring 2014. 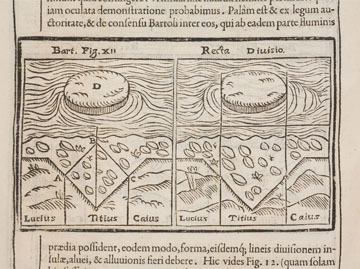 The title is De mercatura decisiones, et tractatus varii et di rebus ad eam pertinentibus, published in Cologne in 1622. 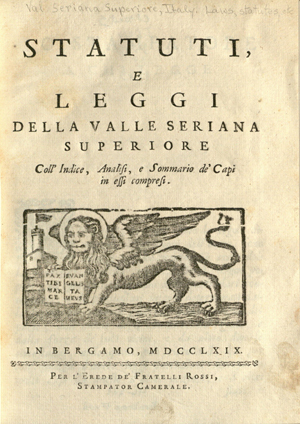 The volume is about commercial law and contains some decisions of the commercial court in Genoa, as well as various other writings on commercial law. We don’t know how it came into the possession of the LA County Law Library. There is one unusual thing about this volume: our copy has laid in before the title page a map, 14 x 17 cm. Since the land mass looked a little like the shape of Africa, I still wasn’t too surprised. A little closer look, and I saw “to Panama 82 miles.” OK, now I’m interested. I searched the map and found that the Library of Congress has a copy of this map in their Panama Canal collection. 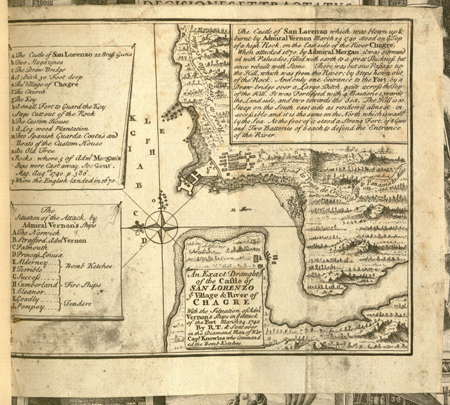 The catalog record is beautiful, and it indicates that the reason for the map was the bombardment of Fort San Lorenzo, Panama, in 1740. Here’s my question. Why did the former owner of this copy of a book on commercial law published in 1622, find it useful to bind in a map of Panama, published in 1740? “The Common Law Epitomiz’d: Anthony Taussig’s Law Books” is the latest exhibit from the Yale Law Library’s Rare Book collection. It showcases the Law Library’s acquisitions from the greatest private collection of rare English law books ever assembled: the collection of Anthony Taussig. 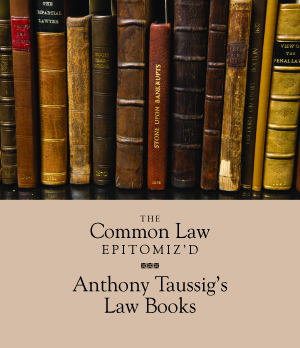 Anthony Taussig, a London barrister, assembled his outstanding collection of rare law books and manuscripts over a 35-year period. 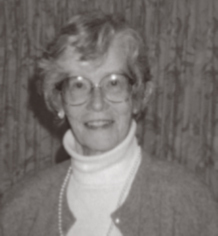 The exhibit is on display through November 15, 2014, in the Rare Book Exhibition Gallery on Level L2 of the Lillian Goldman Law Library (127 Wall Street, New Haven, CT). The books on display include the very first printed book of English law, the first book on women’s rights in English law, the first justice of the peace manual, notes from Sir William Blackstone’s Oxford lectures, a trove of pamphlets on law reform, and a relic of the opening salvo in the struggle to abolish slavery. The acquisition was made possible by generous grants from Yale Law School’s Oscar M. Ruebhausen Fund. The exhibit was curated by Mike Widener, Rare Book Librarian at the Yale Law Library, and Ryan Greenwood, Rare Book Librarian at the University of Minnesota Law Library and the 2013-14 Yale Law Library Rare Book Fellow. Running concurrently is “Uncommon Law: A Celebration of the Taussig Collection,” an exhibition at Yale’s Beinecke Rare Book & Manuscript Library. The exhibition features Taussig’s outstanding collection of legal manuscripts acquired by the Beinecke. It is on display September 5 through December 15.